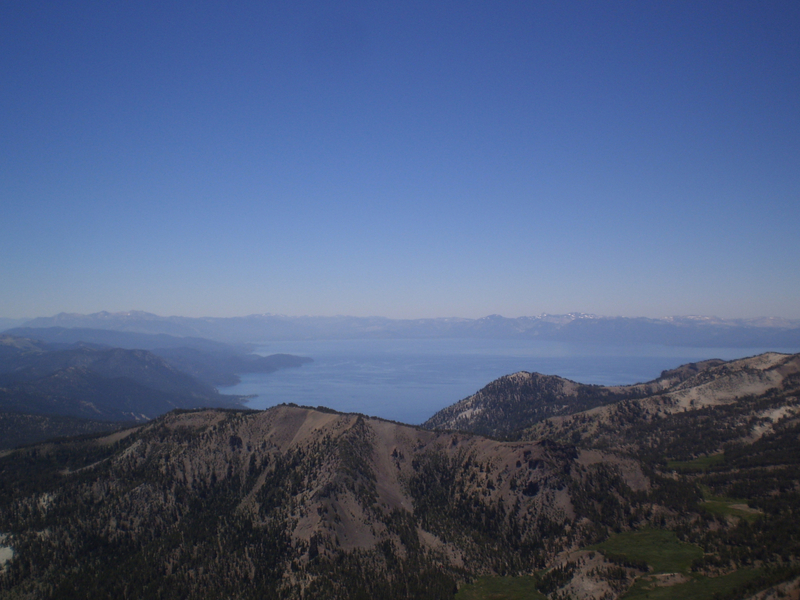 Hikers are rewarder with panoramic views of Lake Tahoe from the summit. 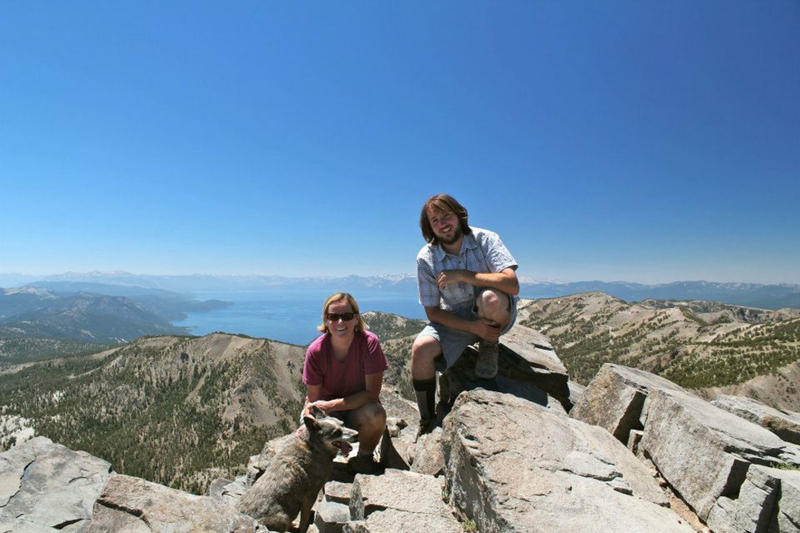 Human and furry friends can all make the trek to the summit of Mount Rose. Even during drought years, Galena Falls provides a refreshing rest stop. This is a 10.4 mile round trip hike with approximately 1,800 feet of elevation gain. This 10.4 mile hike gains approximately 1,800' of elevation and traverses through hot, sun-exposed conditions. This can be a crowded trail on weekends. The best bet for low crowds is a mid-week summit attempt. At 10,776 feet, the summit of Mount Rose stands as the second highest peak in the Tahoe region, and the tallest on the Nevada side of the bi-state watershed. Situated just inside the 30,000 acre Mount Rose Wilderness perched above Lake Tahoe’s north shore, the summit of Mt. Rose offers dramatic panoramic views of Lake Tahoe, the desert valley floor thousands of feet below, and stretching views of the Sierra Nevada spine. 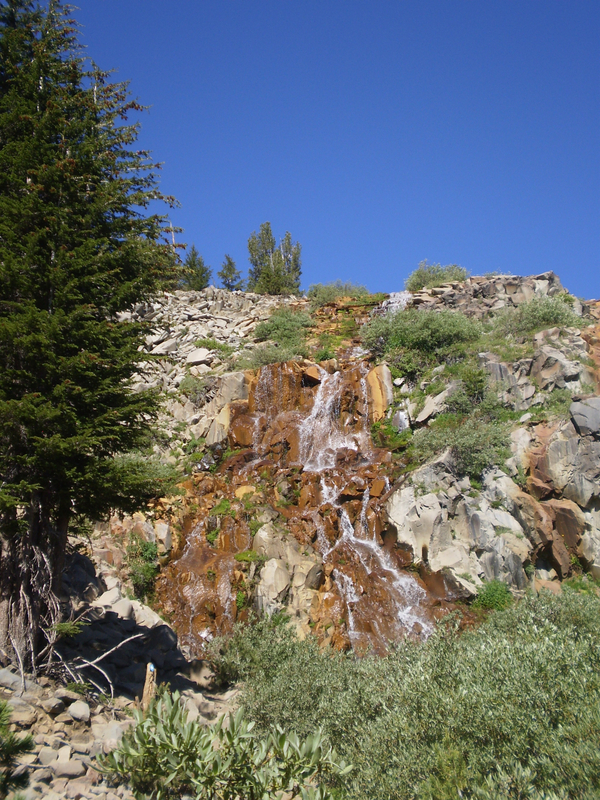 Complete with verdant meadows, flowing waterfalls, and forests of stunted whitebark pine, the hike to the summit of Mt. Rose is a must-do for Tahoe peakbaggers. Beginning from the well-designed Mt. Rose Trailhead plaza, the trail follows the Tahoe Rim Trail as it briefly climbs to gain a ridgeline. After the initial 300 foot gain, the trail meanders through pine forest as it skirts the base of nearby Tamarack Peak. This initial section of trail is filled with buzzing bird activity as multiple species dart in and out of the treetops. Hikers are almost immediately rewarded with a rest stop at gushing Galena Falls a short 2.5 miles into the summit hike. This also makes a good turn-back point for those just wanting a short out-and-back. Galena Falls empties into a beautifully pristine alpine meadow that can burst with wildflowers during the early summer. Hikers will enjoy another half mile of relatively flat hiking before beginning the true climb to the summit. After passing the verdant meadow scenery, the trail begins its steep, dusty climb through wind-blasted whitebark pines. Hikers should bring plenty of food and water, as there are no reliable water sources for this final 2.0 mile, 1700’ climb to Mount Rose. Once above treeline, the final section of trail cuts through a true high-alpine ridge environment where harsh winds make it difficult for any vegetation to survive. From the summit, hikers are rewarded with stunning views in every direction. To the south, Lake Tahoe and the snowcapped peaks forming its rim stare back, while views to the north show the stretching spine of the Sierra Nevada range of hundreds of miles on a clear day. To the east, the floor of Washoe valley lies approximately 6,000 feet below the summit, demonstrating the tremendous uplift when this region was formed millions of years ago. This strenuous 10.4-mile roundtrip hike is perfect for peakbaggers, wildflower enthusiasts, and photographers. Although a long hike, those in reasonable shape with plenty of food and water can easily climb the 1,876 feet to the summit. A lush resting point at Galena Falls presents as a good opportunity for groups to decide whether to push for the summit or enjoy the meadow views in the valley. The Mount Rose Summit Trailhead is located on Nevada Highway 431 just above the town of Incline Village, NV. From Incline Village take NV 431 east for approximately 8.0 miles before arriving at the trailhead on your left. At this time the Mt. Rose Wilderness does not require user fees or permits. Careful respect for the trailhead facilities and practice of leave no trace principles on the trail can keep this area free and open to everyone.